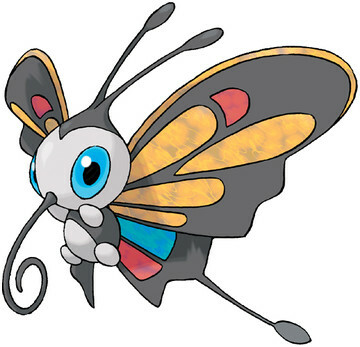 Beautifly is a Bug/Flying type Pokémon introduced in Generation 3. It is known as the Butterfly Pokémon . The effectiveness of each type on Beautifly. In Generations 3-5, Beautifly has a base Special Attack of 90. In Generations 3-4, Beautifly has a base experience yield of 161. In Generation 5, Beautifly has a base experience yield of 173. BEAUTIFLY’s favorite food is the sweet pollen of flowers. If you want to see this POKéMON, just leave a potted flower by an open window. BEAUTIFLY is sure to come looking for pollen. Beautifly learns the following moves in Pokémon Ultra Sun & Ultra Moon at the levels specified. Beautifly learns the following moves when it evolves in Pokémon Ultra Sun & Ultra Moon (regardless of level). Beautifly does not learn any moves by breeding in Pokémon Ultra Sun & Ultra Moon. These moves can only be learned in Pokémon Ultra Sun & Ultra Moon by a previous evolution of Beautifly. Check the respective Pokédex for the exact details. Beautifly can only learn these moves in previous generations. It must be taught the moves in the appropriate game and then transferred to Pokémon Ultra Sun & Ultra Moon. Beautifly learns the following moves in Pokémon Sun & Moon at the levels specified. Beautifly learns the following moves when it evolves in Pokémon Sun & Moon (regardless of level). Beautifly does not learn any moves by breeding in Pokémon Sun & Moon. These moves can only be learned in Pokémon Sun & Moon by a previous evolution of Beautifly. Check the respective Pokédex for the exact details. Beautifly can only learn these moves in previous generations. It must be taught the moves in the appropriate game and then transferred to Pokémon Sun & Moon. What is a good moveset for Beautifly? Which Hidden Power Types are exclusive to Beautifly/ Dustox? Which of the five butterflies is the strongest? What are the odds of finding a shiny Beautifly in Platinum's Eterna Forest? What is the difference between a Male and Female Beautifly?